Welcome to the "Frequently Asked Questions" portion of our website. as well as answers to various questions regarding tattooing and body piercing procedures. If you have any questions or concerns, please take the time to read the following information carefully. Our goal is for our clients to feel as comfortable and informed as possible before beginning their tattoo or piercing journey. How old do I need to be to get tattooed ? At least 18 years of age, with a valid photo ID. If you are between the ages of 16-18, you need to come with a parent or legal guardian. How old do I need to be to get a body piercing ? We do not pierce anyone under the age of 16. If you are between the ages of 16-18, you need to come with a parent or legal guardian. Do I need to make an appointment, or do you also accept walk-ins ? We accept walk-ins, but it is always better to make an appointment. I am planning to get a tattoo and/or piercing--is there anything I should do to be prepared? We suggest getting a good nights sleep, having a good meal before hand, wearing appropriate clothing, keeping good personal hygiene, and relaxing. Is tattooing / piercing safe ? Most definitely at INKS & PRICKS TATTOO STUDIO . We pride ourselves in practicing hospital sterilization and cleanliness. We regularly test our sterilization equipment and only use single-use pre-sterilized Disposable Needles . All of our professionals are certified by the Board of Health. Some one told me that I should get drunk before being tattooed / pierced to tolerate the pain--is this a good idea ? if you are obviously under the influence of alcohol or drugs. both the application of the tattoo / piercing and the healing process. Do you do tattoo / piercing parties ? establishment to ensure the safety of both you and your artist. you'll be paying for it later in many ways. How will the ink colors appear on my skin ? Everyone's skin tone is different, causing the colors to show up differently on each person's skin. If you have a lighter skin tone, colors will appear more vivid. If you have a darker skin tone, the pigments will look more muted. Your artist will select ink, making sure it is the best choice for your skin tone. What about allergies to ink ? an allergic reaction to ink is extremely rare. If you do have a reaction, you may want to consult a doctor and have proper testing done for an explanation. the tattoo / piercing process to which you are allergic (ex. latex). Can I get tattooed / pierced if I'm pregnant ? No. Our staff at INKS & PRICKS Tattoo do not want to put pregnant women or their unborn children at risk. Anyone with a serious illness should consult a doctor before being tattooed / pierced. How can I contact INKS & PRICKS TATTOO STUDIO ? Week Days 10am-7pm, and Sundays 10am-8pm. The better you take care of your body, the better it will take care of you. You should come well rested and well nourished. You should not consume alcohol the night before. Also, choose your clothing wisely. If you are getting a tattoo on your upper arm, wear a tank top. If you are getting a thigh tattoo, wear comfortable shorts. Also, if ink gets on your clothing it may not wash out--don't wear your fanciest white blouse. The use of illegal drugs and alcohol will not be tolerated. Once you have made the decision to get a tattoo, you'll need to evaluate your budget. When it comes to tattoos, you often get what you pay for. so it is highly recommended that you go into the studio and discuss the design in detail with an artist. Some of these factors are: color, size, placement, level of detail, and level of difficulty. and the more time an artist has to spend on a tattoo, the higher the price will be. and the artist will take that into consideration when designing the tattoo. estimate over the phone or internet. When choosing an artist/studio, price should never be the deciding factor. If a studio is offering discount tattoos, it is wise to question their reasoning. Is the work that they produce of the highest standards? Are they using the best equipment to ensure your safety? Does the staff make you feel comfortable and safe? an infection, or a lifelong disease. Professional tattoo artists will sterilize their equipment after each use. They use a steam pressurized autoclave when disinfecting their equipment. Liquid cleaners should be used only to clean debris from equipment, preparing them for sterilization. Once the cleaners have been used on the instruments, they will then be autoclaved, which will sterilize them. We do not re-use any equipment that could come in contact with bodily fluids. When the tattoo artist does the tattoo, he/she should always wear disposable gloves. of upon completion (ie. needles, paper towels, ink caps, barrier film). Before the tattooist starts the tattoo, he/she should always open a brand new set of needles. 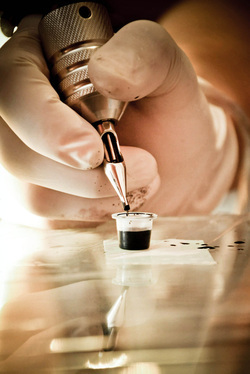 Pigment must be poured into small single use ink caps. you very well may be sharing fluids with previous clients. The working area should always be clean and sanitary. you could find yourself in a never ending spiral of infection and disease. as well as internal aging and regeneration. The way a tattoo looks may change with the skin as it shrinks, stretches, and ages. as well as how you continue to take care of it. though they must be kept moist to prevent excessive scabbing. If allowed to scab, the scab that forms may remove some of the color from the tattoo. The number one enemy of tattoos is the sun. the pigments found in tattoos will fade. while blue and black are the easiest and most stable to maintain. you may want to forgo color and choose black and gray. Tattoos need to be maintained to keep their colors bright. If you are going to be out in the sun, you should always cover your tattoos as well as wear a quality sunscreen.